Before reviewing a book, I always do a bit of research on the author and illustrator. 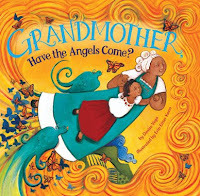 Imagine my surprise to find that Erin Eitter Kono, the illustrator of Grandmother, Have the Angels Come? grew up very near Wisconsin, in Dubuque, Iowa. Her illustrations in this new book are simply gorgeous, full imagery and swirling colors in radiant oranges, yellow and reds that remind me of Mexico. Using lyrical verses and symbolic imagery, author Denise Vega touches on the relationship between a grandmother and granddaughter and explores the mysteries of aging. Over and over the granddaughter asks her grandmother various aging questions, all starting with the lines, "Grandmother, Grandmother, have the angels come?" With amazing wisdom and love, the Grandmother answers the questions in a unique, reassuring way. Some of the five senses are covered in this book: sight, touch, taste, and hearing. This is one of the few children's books I've seen that portrays aging in a positive light. Even as the Aztec-styled sun sets, love, light and beauty reign. Brilliant Monarch butterflies are a recurring symbol in the book and flutter over many of the pages. Interestingly enough, every year the Monarch butterfly migrates to the Michoacán forests in Mexico. This migration happens during the Dia de los Muertos (Day of the Dead) holiday. For the residents of this area, butterflies serve as a representation of departed loved ones souls. This book would be an appropriate fictional picture book read during the Day of the Dead holiday. The book creatively depicts aging and does hint of death. Even though the title includes the word "angel" this is not a work of Christian fiction but rather one I would categorize inspirational or spiritual. Most children will not understand the deeper messages portrayed in the book without some explanation, so the book is not particularly scary or upsetting. My preschool daughter loved all the butterflies shown in the book as well as pictures of the sun with a face. This looks like such a lovely book. I love books with references to Mexico as it is part of my husband's heritage and I want to share that with my children. I am always on the look out for books like this. Thank you!